Wes hasn't connected with his friends on Goodreads, yet. Wes Rand is the bestselling author of the Evil Stryker series (Left to Die, Cross Cut, and Payback is Hell). Rand was inspired by author Ayn Rand combined with his passion for western novels and the desire to create something gritty and real, the idea for the Evil Stryker series was born. His books follow Stryker on the run from a murder he did commit and living by his own code of conduct, killing all who gets in his way. Based on a political world, Rand writes about a mean antihero set in the historical west. But these are anything but your grandfather’s westerns. Wes Rand was an Artillery Officer in the U.S. Army during the 1960’s. He pays alimony. He doesn’t like to golf but lives on a golf course. 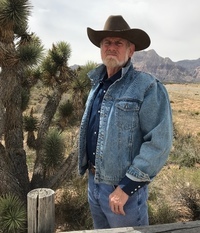 He has been bucked off a horse and two w Wes Rand is the bestselling author of the Evil Stryker series (Left to Die, Cross Cut, and Payback is Hell). Rand was inspired by author Ayn Rand combined with his passion for western novels and the desire to create something gritty and real, the idea for the Evil Stryker series was born. His books follow Stryker on the run from a murder he did commit and living by his own code of conduct, killing all who gets in his way. Based on a political world, Rand writes about a mean antihero set in the historical west. But these are anything but your grandfather’s westerns. Wes Rand was an Artillery Officer in the U.S. Army during the 1960’s. He pays alimony. He doesn’t like to golf but lives on a golf course. He has been bucked off a horse and two women. To ask Wes Rand questions, please sign up.